Am I getting the spiritual food and shelter I need to survive, or is my tree being blown down by the forces of information overload and rampant materialism? Am I part of a strong community, providing a warm and nurturing environment? Or am I cast into the pale bleak anonymity of urban life and cyberspace? Am I looking to future generations knowing that I am providing them with the proper foundations for their lives? The source for the holiday of Tu B’Shvat, which is coming up on Saturday evening, is the opening statement of the Talmudic Tractate Rosh Hashana: The Academy of Hillel taught that the 15th of Shvat is the New Year for the Trees. What does that mean, New Year for the Trees? Do all the cedars and pines get together, make resolutions to improve themselves, and dip apples in honey like we do in our Jewish New Year? Of course not. 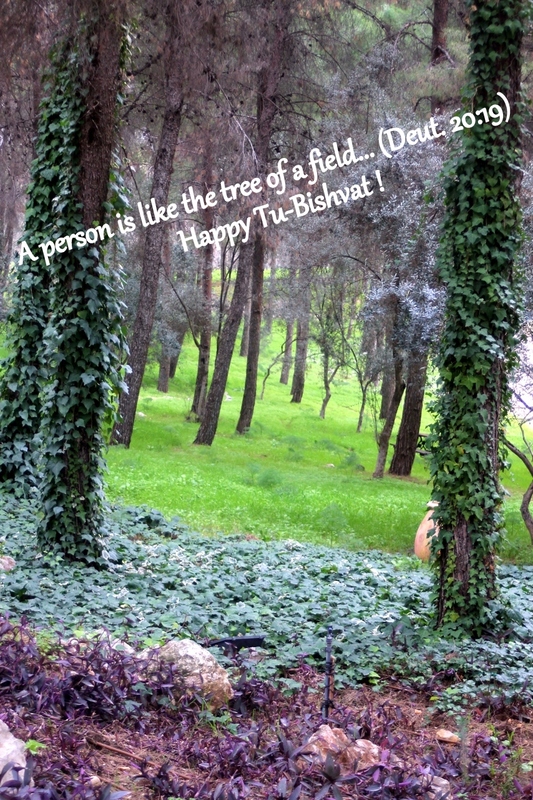 Tu B’Shvat is technically the day when trees stop absorbing water from the ground, and instead draw nourishment from their sap. In Jewish law, this means that fruit which has blossomed prior to the 15th of Shvat could not be used as tithe for fruit which blossomed after that date. So what relevance does this have for us in the 21st century? A tree needs to be planted firmly in the earth. The soil is not only the source through which nourishment is absorbed, but also provides room for the roots to grow. A person whose wisdom exceeds his good deeds is likened to a tree whose branches are numerous, but whose roots are few. The wind comes and uproots it and turns it upside down. Rain-water is absorbed into the ground and — through an elaborate system of roots — is carried throughout the trunk, branches and leaves of the tree. Without water, the tree will whither and die. The Torah is compared to water, as Moses proclaims: May my teaching drop like the rain (Deut. 32:2). Both rain and Torah descend from the heavens and provide relief to the thirsty and parched. The Torah flows down from God and has been absorbed by Jews in every generation. Torah gives zest and vitality to the human spirit. A life based on Torah will blossom with wisdom and good deeds. Deprived of water, a person will become dehydrated and ultimately disoriented, even to the point where they may not be able to recognize their own father. So too, without Torah, a person becomes disoriented — to the extent they may not even recognize their Father in Heaven, the Almighty God of Israel. A tree needs air to survive. The air contains oxygen that a tree needs for respiration, and carbon dioxide for photosynthesis. In an imbalanced atmosphere, the tree would suffocate and die. The Torah (Genesis 2:7) states that God breathed life into the form of Man. The Hebrew word for breath — nesheema — is the same as the word for soul — neshama. Our spiritual life force comes, metaphorically, by way of air and respiration. We use our senses of taste, touch and sight to perceive physical matter. (Even hearing involves the perception of sound waves.) But smelling is the most spiritual of senses, since the least physical matter is involved. As the Talmud says (Brachot 43b): Smell is that which the soul benefits from, and the body does not. In the Holy Temple, the incense offering (sense of smell) was elevated to the once-a-year Yom Kippur offering in the Holy of Holies. The Talmud (Sanhedrin 93a) also says that when the Messiah comes, he will smell and judge — that is, he will use his spiritual sensitivity to determine the truth about complex matters. A tree also needs fire — sunlight — to survive. The absorption of energy from the light activates the process of photosynthesis, a chemical reaction that is essential for the growth and health of the tree. Humans also need fire — warmth — to survive. This is the warmth of friendship and community. People absorb the energy of peers, friends, family, neighbors and associates — and channel that into identity and actions. All the essential observances and ceremonies of Judaism are based on family and community — from the celebration of birth, through the attainment of maturity, marriage, education, and even death. An old man was planting a tree. A young person passed by and asked, What are you planting? A carob tree, the old man replied. Silly fool, said the youth. Don’t you know that it takes 70 years for a carob tree to bear fruit? That’s okay, said the old man. Just as others planted for me, I plant for future generations. This entry was posted in Fresh Vegetable Salads, Judaism and tagged almonds, Brandy, Figs, Jewish holiday, red wine, Tu Bishvat. Bookmark the permalink.